Blog writing is like a vitamin for your company website. Blogs clarify your brand voice, generate sales leads, increase your SEO score which improves your ranking in search on google and it increases and boosts your social media engagement when shared on your social profiles. This all sounds fantastic so why don’t more business owners and marketers blog? We know it’s good for the bottom line so why aren’t we all blogging? I believe the answer is a breakdown in either your systems or your habits. Do you have a system in place for blogging? Did you ever actually learn how to blog and have you held yourself accountable to executing what you know on a consistent schedule? 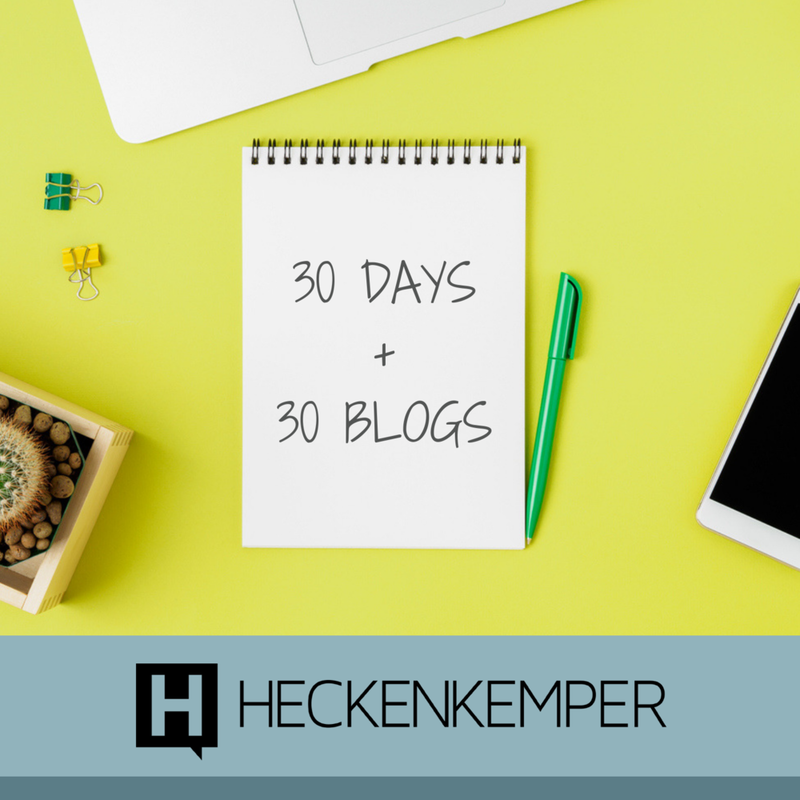 Let’s tackle learning the system of blogging and creating a habit in your daily work flow with the 30 day blog challenge in December 2018. Join me now and by the end of the year you will have dramatically increased your search return for your website, generated new business leads and boosted your social media followers and engagement. Let’s Get Started…before we dive into the details and back end mechanics of blogging on your website and how to manage blog categories, keyword meta data or even scheduling let’s talk about the writing process. Get yourself organized and think about your online audience, your target customers and reflect on what you think they want to hear from you? What do you have to say that is valuable and relevant right now? Be purposeful and intentional in what you choose to write on your blog and have a plan so you have a mix of content. Now here is where having a system in place becomes critical. I have a great list of topics but to transform that into a blog post is where things get real. For many this is where you get stuck… as in I have these great ideas but they are on post it notes or in a folder on my desk. Three words to live by for blog writing. SCHEDULE: Actually put the blog post topics on your schedule, yes you are blocking off writing time with the blog topic on your calendar. I personally use Microsoft Outlook so I’ll add an appointment for each of these blog topics and schedule blocks of uninterrupted time for myself to write. I strongly suggest that you give yourself a running head start and put the ones that you believe will be easier to write in the first week. Make a list 1-30 and assign one of the blog topics you came up with in brainstorming for every day of the month. December is 31 days long so in this 30 day challenge I’m giving myself New Years Eve off so if you are following along with me let’s plan to have a new blog post go up Dec 1 - Dec 30th. WRITE: Blog posts can be as simple as a short few paragraphs, to full descriptive tutorials with downloadable guides and graphics. You may even decide to do video blogging instead (vlogs) or a blended mix of all of the above. The point is you have to put writing time on your daily schedule. Give yourself a cut off to finish it then post it. You must hold yourself accountable to publish when your time ends. I’m serious, use your time management skills and yes I know you’ll have to adjust your topics and ideas on the fly when you see you might be running out of time on a specific blog post. This is why we like to write a blog post with the big idea, get your framework down then go back and add details and examples as time allows. Get as far as you can and when your writing time ends, it’s done. Yes, really it’s done. If you are tackling a broad robust topic… you may consider writing a part 1 and part 2 series and break your topic into two separate blog posts. Rely on your editing skills here and ask yourself if it really does justify two separate posts? POST: Post your blog, be sure to include a graphic or photo when appropriate as well as an excerpt description that will appear in link previews. Tip: If you are writing ahead and have several blogs written then schedule your blog posts to publish on your website so you don’t have to manually post each day. My website is built on squarespace and it is easy to schedule blogs in advance on that platform. I know that wordpress and many other web platforms let you schedule your blog posts in advance as well. Lastly, after your posts are published each day share a link to the blog post on your social media profiles to drive traffic to your website!